Rejoice, ye fans of mad motorsport! In just under two weeks the toughest hill climb in the country will once again kick off to determine who out there is the fastest of the rubber room fugitives, the quickest of the window-licking insane. Over 70 cars are registered to attempt the fastest time up the terrifying mountain road, racing above the trees and into the clouds, laughing in the face of perilous drops all the way up. I am, of course, talking about the upcoming Pikes Peak International Hill Climb Mount Washington "Climb to the Clouds." Wait, what? It's no surprise many balk at the claim that the Mount Washington climb is tougher than Pikes Peak. Pikes has become synonymous for hill climb in the states, a legacy that has now spread around much of the globe as well. From the long-standing record of New Zealand's Rod Millen and his constant drive to break the ten minute barrier to last year's globally touted record-obliterating run by French rally god Sebastien Loeb, if you're a racing fan you know of Pikes Peak, regardless of where you get your mail. On the flip side most people outside of New England couldn't get within 150 miles of pinpointing Mount Washington on a map, and more than a few would guess it's on the opposite side of the country from it's actual location in northern New Hampshire. So honestly, where do I get off saying the climb up Mount Washington is tougher than the climb up Pikes Peak? The 12.4 mile run up Pikes is a full five miles longer than the measly Mount Washington Auto Road, and the pathetic 4,500 foot vertical ascent up Washington is absolutely dwarfed by the mighty 4,700 foot climb of Pikes Peak. Did you catch that? Despite being a full five miles longer, the climb up Pikes Peak is only about 200 feet greater than the run up Washington, even though Pikes is a significantly taller mountain. What this means is that mile-for-mile Mount Washington is far steeper of a climb. So steep, in fact, that some older Hondas with automatic transmissions aren't allowed to drive up the mountain because they can't be locked into first gear and their second gear is too tall to safely restrain the car on the descent, and driving down riding the brakes the whole way is virtually guaranteed to overheat the brakes to dangerous levels. But it takes more than just grade to create a difficult climb. Anyone can drive up a straight road (well, anyone not in a Honda). So let's take a look at the roads themselves. Pikes Peak has 156 corners, which averages out at an impressive 13 corners per mile. I've run rally stages with far less frequent corners than that. Mount Washington meanwhile sits at about 130 corners, or just under 18 corners per mile. That is, according to my records (and yes, I do track this stuff), twistier than almost any rally stage I've ever run. Score another point for Mr. Washington, and the mountain named for our founding father is just getting started. The Pikes Peak Highway, the toll road used for the hill climb, is a fantastic road. One look at the smooth, winding tarmac and gorgeous scenery and it's no wonder it's become such a popular tourist destination and legendary race course. Even at the 15 MPH speed limit a drive up Pikes Peak is a fantastic time in a car. Mount Washington is, effectively, the antithesis to the carefree journey of the Pikes Highway. Most residents of the northeast have seen at least one car driving around with a "This car climbed Mount Washington" bumper sticker plastered to the back. Most dismiss the declaration without a second thought ("Big deal, you drove up a hill"). But the fact of the matter is that sticker is a badge of honor, because put simply the Mount Washington Auto Road is terrifying (and I mean that in the best way possible). The average width of the road is a scant 20 feet (less than the length of the Mount Washington shuttle vans), with no shoulder or runoff beyond that road edge. Go six inches off the road and you're either against a tree, against a cliff face, or taking the express elevator back down to ground level. There are no guardrails, for most of the road there are no painted lines, and for one pucker-inducing mile just above the tree line the road shrinks to about 15 feet wide and becomes dirt. After finishing his first run up the mountain in the 2011 climb, mad Freightliner hilclimb rig driver Mike Ryan, a man with stones bigger than his turbos, unsteadily got out of his cab and reportedly uttered "That was so scary my hands were shaking for the last few miles!" The Auto Road was originally built in 1861, designed as a way for tourists to travel to the summit via horse-and-buggy. Since then the road has evolved immensely over the years, making it friendlier, more modern, and more suitable for the automobile. By which I mean they paved it and did pretty much nothing else. Well, paved most of it anyway. The road has not been significantly widened or leveled since that original surveying over 150 years ago. As a result the road is not only a narrow, endless series of corners, but also an endless series of crests, as the grade of the road changes constantly and at times aggressively, to the point that some of the crests are small jumps for the faster competitors. If Pikes Peak is a race course then Mount Washington is a rally stage. 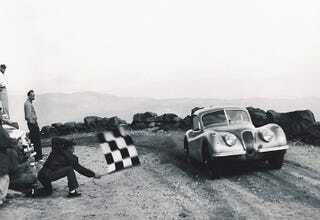 No wonder unrestricted rally cars are often the weapon of choice for drivers seeking to break the mountain's record. As it happens, I'm currently sitting in the summit building atop Mount Washington, writing this preview piece. At the base of the mountain it was bright, semi-sunny, and a reasonable (unless you're a wimpy Texan) 64°. Here's what it looks like outside the mountaintop visitor center. This right here? This is normal. According to the weather data screen near the building entrance it's 43° at the time of writing (click here to see what the weather is now as you read), with winds gusting to 50 mph and visibility at about 150 feet. Mount Washington has the moniker "home of the world's worst weather," and for good reason. On any given day there's only a 33% chance of seeing the sun, the average summer temperature is in the 40s-50s, the average wind speed at the summit is 35 mph, and 2 out of every 5 days it's subjected to hurricane-force winds of over 75 mph. What was long regarded as the highest ground wind speed ever recorded came from the top of Mount Washington, at a NASCAR-shaming 231 mph (technically the highest wind speed recorded belongs to Tropical Cyclone Olivia, but c'mon, that was a friggin cyclone. Washington is still second highest behind Olivia, beating every other hurricane and cyclone). In a single day the summit can go through a month's worth of weather, going from 50-foot-visibility fog, to sun, to rain, to snow flurries, to hurricane winds, and back again. Predicting the visibility and conditions of a run during the race is difficult-to-impossible except on the very best of days (or the very worst of days). You won't see the ridiculous thousand horsepower hillclimb monsters of Pikes racing Mount Washington, largely because power and downforce aren't as critical here as suspension and mechanical grip, but that doesn't mean everyone is simply tootling up the hill in Subaru Imprezas. The roster contains everything from pristine caged classics of the 70s and 80s to rally cars (Rally America is bringing a 20-car rally field) to electric racers to former circle track cars to early vintage racers (like this gorgeous 1940 Sprint Car) to bonkers tube frame creations like Paul Tingaud's Audi Super Chicken. There are even two Jalopnik commenters/Oppositelock authors on the entry list, Sherman Baumann driving his Buffalo Racing Mod Lite and me co-driving the R2 Ford Fiesta of Rally America rookie of the year frontrunner Troy Miller. For those interested in spectating, there will be spectating available during the Friday and Saturday half-course runs via shuttle bus, and with multiple spectating options on Sunday for the full course run. The mountain opens on Sunday, June 29 for spectators to drive to the summit at 6:30 AM. From there you can hike down on the various trails to find a good (SAFE!) spot to watch the cars. There are also shuttle tickets available to ride up to the spectator points at Halfway (just below the treeline) and Craigway (a 160° corner on the dirt around the 5,000 foot mark). For more information on spectating check out the Climb to the Clouds website. While there won't be any immediate TV or online video coverage (feel free to loudly complain about this on social media, bonus points for anyone who shames Red Bull and their relative lack of participation) a review episode will air on NBC Sports on August 2. This is part of Rally America's broadcast series, so it's unknown how much coverage the non-rally classes will receive, a shame since the fastest times will likely come from the Hill Climb Open class. If you're in the area this is definitely not an event to miss. The Mount Washington Climb to the Clouds can be a bit sporadic in terms of being run (last time it ran was 2011, then 2001 before that), so if you miss out this year there's no telling when you'll have another chance. So load up your fellow psychopaths into the short bus and come see the best of the best take on the Mountain of Madness.